UDM Downloads > Pink Calendar and Day Planner! 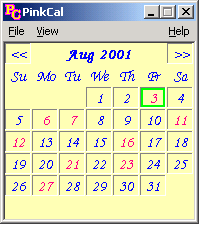 Pink Calendar is a fast, fun and easy to use Calendar and Day Planner program. The calendar is small enough to leave on the desktop. Click on it to open a day planner, type an entry and close - saving is automatic (and so are the pop-up reminders). Easily set appointments to repeat. Quick-check feature: simply pass the mouse over the calendar window to check appointments. Colors, fonts and sounds are user selectable. PinkCal is used by people in over 38 countries. Check www.orangesoftware.net for the latest version.